Hungry Hearts Diner is one of the best relaxing games for mobile devices on Google Play Store. Its gameplay is far better than other shop simulation games. With cute characters, amazing gameplay, and a good story system, Hungry Hearts Diner game has crossed over a half million downloads on Google Play Store. In this post, we have covered everything about the game you need to know. The game uses the energy system; every time you make the food, it cost you energy points. You can track the energy points at the top of the screen. Since these points are limited, you can not make the food unlimited number of times. Energy points re-generates after every few minutes or when you level-up. You earn experience points(EXP) after serving a customer. After reaching a certain amount, diner level will go up. You can check the diner level progress at the top of the screen. Whenever you level-up, your energy gets restored. At the beginning of the game, you can make rice ball only. By unlocking new food items, you can earn more. To make these items, you need to unlock them. How to unlock new food dishes in Hungry Hearts Diner Game? It’s simple; level-up your food by cooking it enough times and unlock new dishes. For instance, cooking rice ball enough times unlocks Nori and cooking Nori enough times unlocks other new dishes. So, to get new dishes, level-up your food. Leveling up rewards you new food items. Level-up your profile and unlock new customers and increase the number of customers; more customers mean more income. Sideboard; to place dishes. There are limited slots, so, you can not place dishes beyond its certain limit. What is frenzy mode in Hungry Hearts Diner Game? In this mode, the customer eats faster. You need a huge amount of coins to upgrade your shop. It’s a basic tip; if you tap on the customer, they will eat faster. By tapping continuously, you can manage a huge number of customers easily. As you know, energy is limited and re-generates after a few minutes. Without energy, you can not cook food and you will lose your customers. To refill energy instantly -> on your mobile phone, go to settings and set the time for next 20 minutes. Pick up a food item and make it enough number of times and level it up. 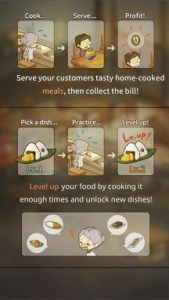 Leveling up unlocks new dishes, by serving new dishes to the customers, you can earn more coins. Collect the coins and spend on upgrades; add sideboard to place more dishes; you can not remove a dish if you have placed it on the sideboard. Add chairs and tables for customers, add the refrigerator and other useful items and improve your shop.